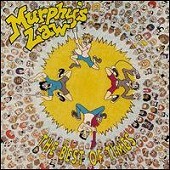 Murphy's Law 1991 released full-length The Best of Times and 1993's Good For Now EP are available once again, on one album. The Best of Times / Good For Now is a combination of these two albums, obviously. These records may have been somewhat original back in 1991 and 1993. But their mixture of pop-punk, ska, punk, and funk is now so old and outdated, they sound like a bad college rock band trying to experiment with a variety of sounds until one gets them an audience and they can ride it to fame. In other words, this is an annoying pop-punk album that is schizophrenic at every chance it gets. I'll give it a D.